For the last year, I have searching for a good dog bed. I have to consider cost (because we have three dogs) , durability (because the dogs are big) and style (because, despite having three dogs, I want something nice). Our dogs seemed to prefer a pile of clean laundry to their own dog beds. It took being introduced to Karma Charms to realize that the answer was right in front of me! 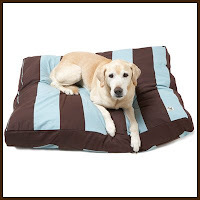 Karma Charms has developed a dog bed duvet system where you can cover your existing dog bed with a stylish duvet cover. No dog bed, no problem. Karma Charms also provides a stuff sack that fits inside the duvet cover. The stuff sack can be filled with comfy old blankets, pillows, clothes, rags, towels, etc. As an added bonus, the stuff sack and it contents can be easily cleaned in the washer. I love all the 100% cotton patterns and their use of earth friendly products. The dogs love the soft bed that smells like family. Thanks to Dana, Karma and Karma Charms, we have a Sweet Dog GIVEAWAY! 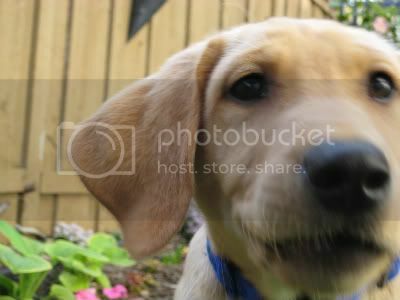 One lucky winner will win a Snowcones and Puppies Dog Duvet (pictured above) and stuff sack. Post a comment on this blog post telling us a product you like on the Karma Charms web site (1 entry). Please include your email address. If you do not have a Google account, select anonymous. The winner will be selected at random. Contest Ends 05/29/09. This contest has ended. Congratulations to our winner, Cassandra. Thanks to all of you who participated in the giveaway. I appreciate your support! Check back for more great product reviews and giveaways.